Click photo to download. 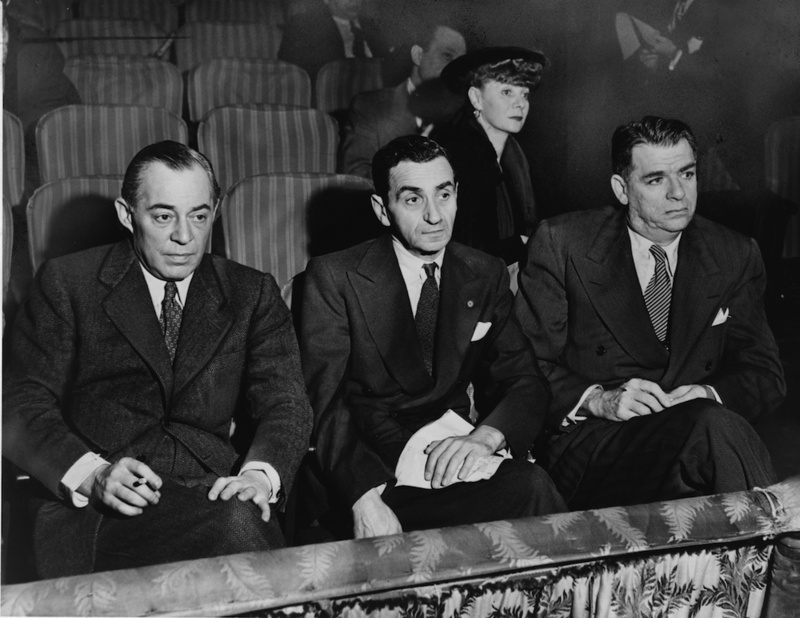 Caption: Left to right, Richard Rodgers, Irving Berlin, Oscar Hammerstein II, and Helen Tamiris (back), watching hopefuls who are being auditioned on stage of the St. James Theatre in 1948. Credit: Library of Congress. Oscar Hammerstein II was raised by Scottish Presbyterians, and the only time he ever entered a synagogue was to deliver eulogies at Temple Emanu-El on 5th Avenue in Manhattan. But according to his grandson Oscar Andrew (Andy) Hammerstein III, his Jewish heritage influenced Oscar II’s work—for which he won eight Tony awards and two Academy awards as a lyricist on musicals including “The Sound of Music,” “South Pacific” and “Oklahoma.” This influence can be traced back to Oscar II’s grandfather, German-Jewish theatre impresario Oscar Hammerstein I.
Click photo to download. Caption: Oscar Hammerstein II. Credit: Library of Congress. According to Ellen Schiff, advisor to the Jewish Theatre of Austria and a consultant to the Foundation of Jewish Culture in New York, Oscar II “was more focused in his endeavors” than his Jewish grandfather. In 1949, Oscar II took a lot of flak for inserting the song “You’ve Got to be Carefully Taught” into “South Pacific.” That song admonished the mostly white, relatively affluent theatre crowd that racism was taught, not inborn, and thus offered hope that a cycle of hate and fear could be broken. Andy Hammerstein said Oscar embraced and championed many progressive causes at a time when it was a difficult thing to do. Oscar II first gave creative voice to his politics in 1927 with “Show Boat,” an epic tale of life on the Mississippi River after the Civil War. In an historic production, blacks and whites not only shared the musical stage, they also shared the plot. In the early 1940s, an FBI file was opened for Oscar, fleshed out and backdated to include the brouhaha surrounding “Show Boat” and the implicit one-world-order goals of the Anti-Nazi League. The New York and Philadelphia FBI offices coordinated surveillance efforts that included tapping his phone lines, reading his mail and sometimes tailing his activities, mostly in New York City. Posted on December 30, 2012 by Robert Gluck / JNS.org and filed under Arts, Features, U.S..